John Rennie will discuss the farms of the Bovlei. John Rennie is a well-known Cape Town heritage architect and a former Chair of the Vernacular Architecture Society. His practice, Rennie Scurr Adendorff Architects, has won a number of awards for its heritage projects. He has been active in the Society from its earliest days and has led many outings and spoken on the subject of our vernacular heritage on several occasions. 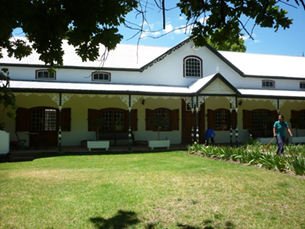 He will discuss the old homesteads of the Bovlei area of Wellington, such as Welvanpas, ancestral home of the Retief family, Nabygelegen, and more. According to Fransen (2004) this ‘Upper Valley’ “contains what is probably the densest concentration of Cape Dutch opstalle and related structures. Cradled as it is by the Groenberg, Limiet, Obiqua and Hawequas mountains and their spurs, the valley forms a distinctive cultural landscape’’. (Fransen: 307). Welvanpas was originally called De Krakeelhoek. It was granted in 1712 to the Huguenot Pierre Mouy who had been settled there since 1705. It was acquired by Jacobus Retief in 1784 although there was a connection to the original owner since Mouy’s daughter had married Francois Retief in 1700. In 1817 Retief demolished the old house and built a new one behind it, higher up the slope. From Fransen we learn that, according to the late Dan Retief, great grandson of Jacobus Retief, the latter had a slave who designed and built houses. He built Welvanpas, possibly also Nabygelegen and Weltevreden near Stellenbosch. Talks are free and open to the public. Outings, however, are only for paid-up VASSA members.